Are you among of the developers who spend more time replying to emails than adding more features to the app? New startups with small teams or individuals running the entire operation are often faced with the herculean task of providing support to the ever growing user base of the application. This is turn leaves less time to actually spend on developing the app. Ruben Bakkers, developer of Mailplane, decided to do something about it when his brilliant app garnered thousands of active users in a short time. 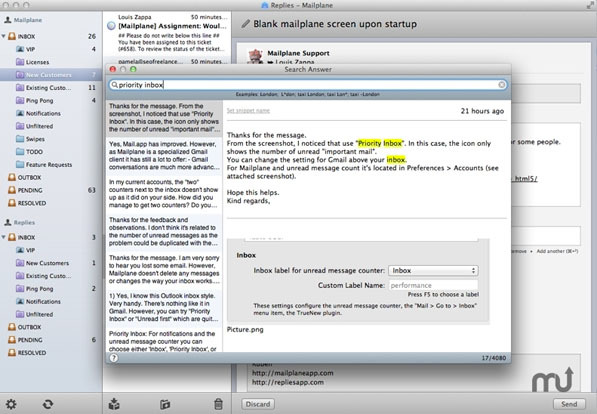 Pestered with support emails, Bakkers designed the Replies App for Mac back in 2009 for personal use. He discovered how most of his replies were repetitive and that a considerable amount of time was wasted in rewriting them. Bakkers recently launched Replies for Mac commercially and we decided to take it out for a spin. The biggest feature of Replies is the ability to search content within old replies and reuse it. All replies sent using the app are broken down into chunks of reusable snippets that you can be later inserted into a new reply. A new reply starts off with a default greeting at the top, signature at the bottom and the snippet box in the middle. Esc is the shortcut key to search for previous replies and selectively add content from them into the new reply. Attachments that were part of the reply can be imported too. In addition to that, you can add attachments by using the drag and drop feature or via the file browser window. More snippets can be added to the reply by using the Cmd + Return shortcut. Alternatively, an icon to insert snippet pops up when the cursor is placed in-between a word space or around a link break. Content reusability makes a lot of sense for customer support and Replies does a good job at helping you find the right content and insert it at the right place. Personalization to a mail helps build relationships with the customers and Replies keeps that in mind. It loads recent conversations with a customer that makes it easier to add personal details to the body of the mail. It never hurts to have the undo button in a mail application. With Replies, you can not only undo the send mail action for a few seconds after sending the reply but also undo other tasks such as dismissing a draft or archiving a message. Replies has a three-pane user interface that Sparrow for Mac users will be familiar with. Left pane lists all the folders, middle pane displays the email subjects and its preview snippet, with the full email content being shown in the rightmost column. The folders in the leftmost pane are sorted according to priority; helping you respond to important mails quickly. This is pretty much like the Priority Inbox feature that Gmail has; but only better. Folders can be made smarter by applying a bunch of filters to have them sort the mail intelligently. Any new folders created using the app are synced across to the server. Another really handy feature is the ability to mark messages as pending or resolved. All these small things help you save a great deal of time in the long run. Customer support can become a challenging task when the number of active users grow rapidly for an app. 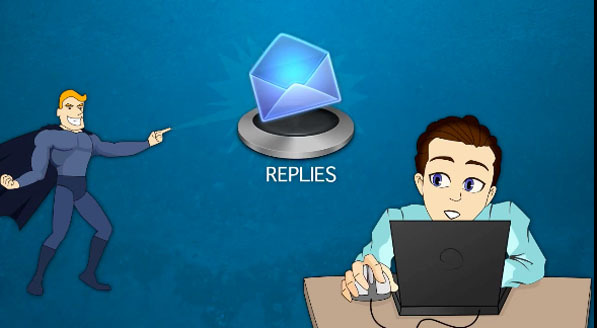 Replies not only helps you save time but also lets you send personalized and detailed messages to every customer. A lot of thought has gone into the Replies app and it is a good solid app to deploy for your customer support needs. The app comes with Full-screen support for Lion and after spending the last few days with the app, I can vouch for its stability and usability. Customer support junkies might find the app lacking advanced features but there’s only so much you can expect from the first release. For someone who develops and handles customer support for an app independently, Replies is a godsend and there isn’t better investment for your company than spending $79.99 for this app. Organizational licenses are available for $129.99 a piece. Go grab it now and show off your customer support superpowers!